Sometimes when you’re out of practice, getting outside for a ride in sub-optimal weather is just SO HARD. Today was even more tricky because we were tackling a lot of “firsts”. This was the first time Little Man, the 8 year old, would ride a solo bike at temperatures this cold. To make matters more interesting, he decided that today was a good day to try riding his road bike outdoors for the first time AND he insisted on riding clipless. I was terrified we were in over our heads from the get-go. We rolled down the sidewalks and out the paved blacktop path near the house. I told him if we reached the far away gas station, 5 miles away, I’d let him spend $4. Why $4? Why not. 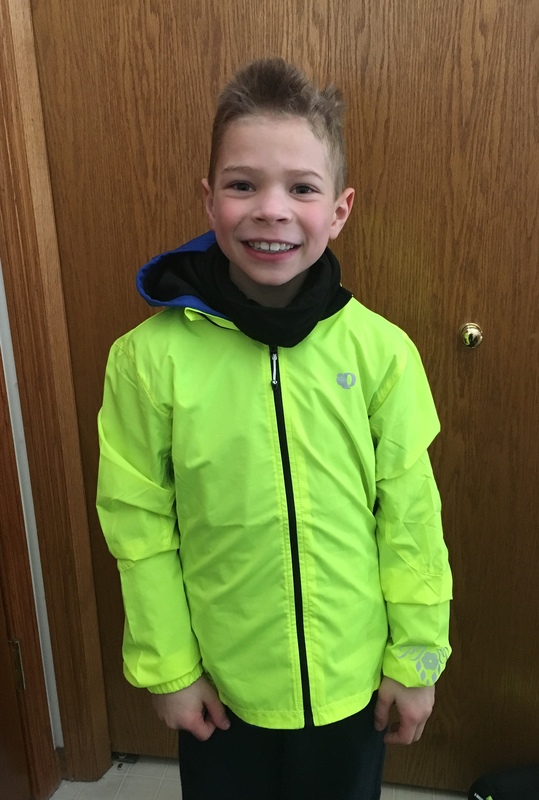 Since we’d be on road bikes and presumably rolling fairly fast, I outfitted him in the following – and I had ZERO complaints that he was cold! Nailed it! I think he got the idea to ride road bikes when he unexpectedly got a new helmet today. There was a package and he looked sullen as he walked it up the stairs, telling me there was no way it was for him. I smirked and asked if he’d open it, because “maybe” it was for him. He perked up and said “maybe is what adults say when they mean yes! 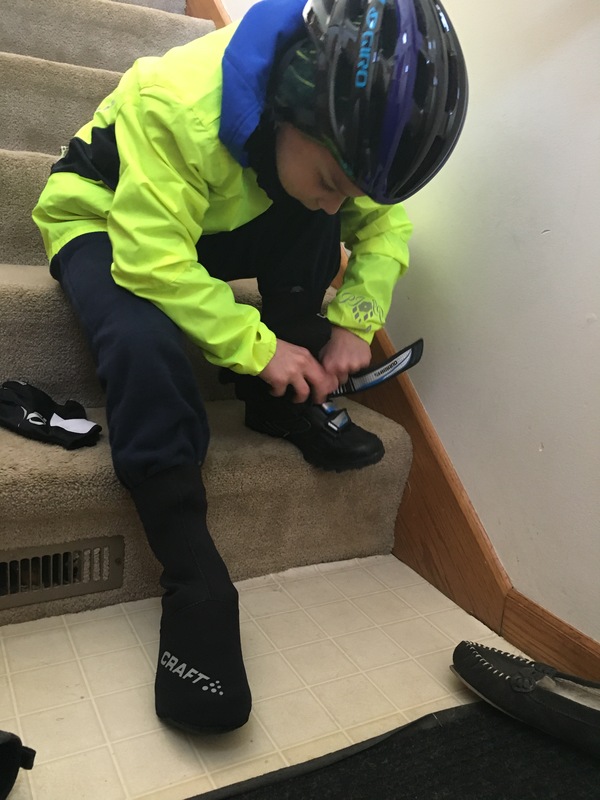 !” He was right — he was ecstatic to finally have a sweet Giro helmet that closed “like an adult’s, not like a kid’s.” It has the same closure as my $200 lightweight road helmet at a much better price point. Excellent $20 spent then on a Warehouse deal! I noticed my size in that color isn’t very expensive, and I kind of want to get a helmet like his so we can be all matchy-match on the tandem. 😉 Lately the neighbor kids have been telling him that helmets are stupid, so if getting him a nice helmet in one of his favorite colors helps combat those other voices, I’m all for it. It felt like an eternity getting both of us dressed, getting his road bike down from the rafters and checking it over, airing up tires, and heading out. He tentatively rode around the driveway a few times practicing clipping in and out. His pedal tension is set nice and easy at this point so he had no problems. He had a winter of practicing clipping in and out on the stationary trainer, learning road bike shifters, AND riding rollers a handful of times to improve his balance on this bike. When I see how good he could be and his natural ability, I want to push him harder on the bike but I resist. I nudge and shamelessly bribe him to ride, but I never force him unless he’s committed ahead of time. We rolled down the sidewalks and out the paved blacktop path near the house. I told him if we reached the far away gas station, 5 miles away, I’d let him spend $4. Why $4? Why not. As you may have figured out by now in adulthood, there is often no rhyme or reason for the mom-bribery that takes place. He accepted the bribe and off we went. We navigated multiple busy intersections with no falls and headed out the rolling hills through the farm fields to the far away gas station. We hadn’t made it very far when he dinged his bell at me, the “I need something” sign from our early mountain biking days, so I pulled over. He stopped and looked at the looming hill ahead and said he wanted to go home now, and to just go to the gas station a mile from the house that we had barely just passed. I thought it over. Do I force him to do the whole route? Let him bail now? Something in between? I told him he had committed to this ride and it had taken us forever to get ready. I wanted him to ride to the top of the hill up ahead, and then we could turn around. However, he would get some money for a snack at the gas station but not the promised $4. We had a surprisingly rational discussion and we agreed on this compromise. I pedaled ahead, and Little Man kept dinging his bike bell 3 times, what he had declared as his “I want to go home” signal. I shouted back to him, too bad, you promised, we are NOT turning around here. I sighed and was waiting for him to start yelling or whining. Instead, this bright yellow blur flew by me — he was out of the saddle, sprinting for all he was worth, and giggling. He had attacked! He settled into a quick cadence and sat back down, riding very low. When I rolled up to him he announced that he was “riding like the bike racers do”. My heart melted right there on the spot. I sighed and was waiting for him to start yelling or whining. Instead, this bright yellow blur flew by me — he was out of the saddle, sprinting for all he was worth, and giggling. He had attacked! He climbed the hill well, and we turned around as promised. Now we had the wind at our backs and riding was much more pleasant. We talked about wind, riding, and aerodynamics, and did he notice the wind felt different on his face and body now then it did before? We got to the top of the final hill and he rolled up to push the “walk” button on the crosswalk. He had gotten cocky and only unclipped from one pedal, leaning sideways to hit the button. However, he lost his balance and did the slow-motion fall towards me, luckily NOT on the derailleur side of the bike. I calmly helped him up even though he was grumpy and blaming me for the fall. Ha! We went to Kwik Trip, the cyclists mecca. If you’ve read my blog for a while, you may remember that Kwik Trip is the gas station of choice for me when doing gravel rides. They have a selection of both your normal, delicious, gas station junk food and a complement of real food (bananas, yogurt, applesauce, pickles, cheese sticks). I reminded Little Man that he had forfeited his $4, but I would still let him get SOMETHING. He settled on a slushy and I balanced it on my handlebars and we rolled the rest of the way home. It was harder than heck getting out the door today. During the whining and near-tantrums that happened as I begged him to wear warm clothing, I almost scrapped the whole plan. However, I am SO GLAD I didn’t — I will likely not forget the sight of my tiny 8 year old, sprinting for all he was worth on a little red road bike, flying by me in a blur of yellow high viz with the sound of his laughing in the air. WORTH IT.